Samantha Read competed for Caltaf in the sprints and middle distance events. She competed for the U of C Dinos (1988 -1993), and was a member of the 1991 National Championship team, earning All Canadian status that year. She then moved to the United States and competed for the Nike Farm Team (1996-2001) in the middle distance events. 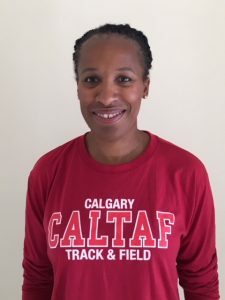 While living in the United States she was the Head Track and Field and Cross Country Coach at Mountain View High School in Mountain View, California (1996- 2006). In her time there she was named the Santa Clara Valley Athletic League Honor Coach in 2001 (Girls Cross Country), 2005 (Girls Cross Country) and 2006 (Girls & Boys Track and Field). Between 2014 and 2016 Sam and her Cheetah coaching staff had great success. In 2015 Sam was named Grassroots Coach of the Year by Athletics Alberta. She is very proud of the growth of the Cheetahs program and seeing the sea of Red Cheetah t-shirts at all the Meets. She is also very proud that there were 12 Cheetahs Nominated for the 2015 Athletics Alberta Awards. Sam was most recently named the Head Coach for the Zone 3 Summer Games Team. Sam continues on with her coach’s education and is now attained her NCCP Level 2 and is currently working on her Level 3.